Did Jesus die on the Cross? No, say the people and the Eastern traditions of his native land. Where is his tomb? According to Eastern tradition, in the Kashmir capital of Srinagar. This part of Asia is now believed to be the place to which the lost tribes of Israel fled centuries before the birth of Jesus. What is the proof? None other than the Bible, according to some of the reputable Christian scholars noted in the Primary sources on the Home Page. The research of The New Testament relies mainly on the Gospel by Saint John, reputed by most Christian theologians to be the most accurate of the four canonical Gospels. Why does Judas betray Jesus with a kiss when he could have done it more discreetly in so many ways? Could this most famous kiss have been an endearing farewell between a loving master and his faithful disciple instead of a betrayal? If so, what were the events which led to the immortal kiss of death? Who was Joseph of Arimathea? And why did he bring two large bags of aloe and myrrh to the crucifixion when these were used for healing wounds, not embalming a dead body? Why did the Romans break the legs to kill the other two persons crucified with Jesus and did not break Jesus's legs? How did Jesus die on the Cross within three hours when it took more than three days for most crucified persons to die a lingering death? Did Pilate have a reason for asking how Jesus died so soon? Who was the mysterious Beloved Disciple on whose testimony John wrote his Gospel? And how is it that the three other canonical Gospels don't mention this Beloved Disciple at all when he was so dear to Jesus? Why is the raising of Lazarus from death, the most astounding miracle performed by Jesus and narrated in great detail in John's Gospel, not even mentioned in the other three Synoptic Gospels? What is Greek Orphic mythology and how does it play a dominant role in Christianity? Why did it become the core of Christian doctrine, more so than even the Gospels? These are some of the questions raised in this research work, important questions that reach the basic concepts of Christianity. Do you hear them in the church sermons on Sundays or in Bible classes or in ecumenical meetings? 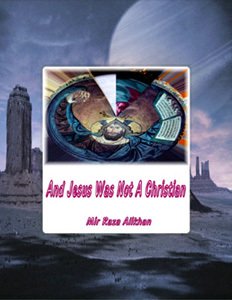 If you don't or doubt what you have heard on these vital Christian issues, then read this book AND JESUS WAS NOT A CHRISTIAN. This thesis illuminates the contentious issues and the many phantom figures vaguely haunting the pages of The New Testament: Caiaphas the High Priest, no longer a villain, astutely leads his people out of a calamity. Gamaliel, the grandson of the celebrated Hillel, recruits Saul as a temple apprentice. Nicodemus and Joseph of Arimathea, Sanhedrin leaders, preserve the integrity of the Jewish hierarchy. Jacob and Simon, the sons of Judas the Galilean, plot an uprising to overthrow Roman rule and avenge their father's crucifixion. Hanina, the disciple of the renowned healer Honi, teaches Jesus the healing art. And Judas Iscariot, the most maligned character in history, shines as the trusted disciple amongst a fickle bunch. Only Paul, intentionally hidden from the action in the Gospels, receives bad press by persecuting deviant Jews professing a new faith. His sudden conversion through a guilt trip and a startling disclosure forms the heart of the story - the miracle we all know so well hides a frightening and more realistic probability. This is a scholarly work which seeks to furnish a sound base for these radical views. Here, dear reader, you will find the firm link which binds world religions into a homogenous entity, having evolved from the same metaphysical source, much like our physical evolution from a common species. Here, you will find the reasons for hiding the clash of the world's most venerated personalities, Jesus and Paul. And the most mysterious figure in history, Jesus, emerges in these pages as the triumphant man, liberated from dogma into a spiritual icon for the 21st century - sans faith, sans sin. And as you read, you will track the footprints of the mystical trend which resolves the obsolete religions of our forefathers into a universal spirituality for these modern times, a spirituality with common aspirations leading to common humanitarian ideals, all in the form of a suspense filled story based on intense research. We offer for your reading pleasure a deeply moving portrait of Jesus, historically reconstructed, and the full vindication of the Jewish people. We explore the binding affinity between all religions. And we believe this book will create a dialogue on the many millennia old Sufi traditions hidden from mankind to escape the doom of the heretic.